(BPT) – Few sights make homeowners more furious than an attractive landscape destroyed virtually overnight by hungry deer. Rose bushes and ornamentals? Nipped off every bud. Expensive shrubs? Browsed within an inch of their lives. Trees? Damaged, disfigured and sometimes dead. Deer – and their wilder relatives, moose and elk – usually leave a path of destruction in their wake, and even winter can’t calm the carnage. In fact, as cold weather descends, deer shift their sights to your most expensive and difficult-to-replace trees, evergreens and shrubbery. However, you can strike a blow against deer’s voracious appetites by maintaining a year-round program of defense such as Bobbex Deer Repellent foliar spray. The product is an environmentally friendly, nontoxic and long-lasting deer deterrent that’s safe for people, pets, wildlife and aquatic life. Ingredients include putrescent eggs, fishmeal, fish oil, garlic and other natural ingredients – all materials that offend a deer’s sensitive sense of smell and taste. Additional ingredients such as urea and Epsom contain natural fertilizer components which are beneficial for all plantings. Although you might imagine winter brings a break from deer destruction, you would be dead wrong – and expensively so. When some food sources die off and deep snow covers preferred food, deer reach up, often nibbling up to a half-bushel worth of twigs or other tree material per day. This can quickly deform or even kill landscape plantings. Tender shoots of new, green growth entice bucks, does and fawns, all ravenous after the ravages of winter. 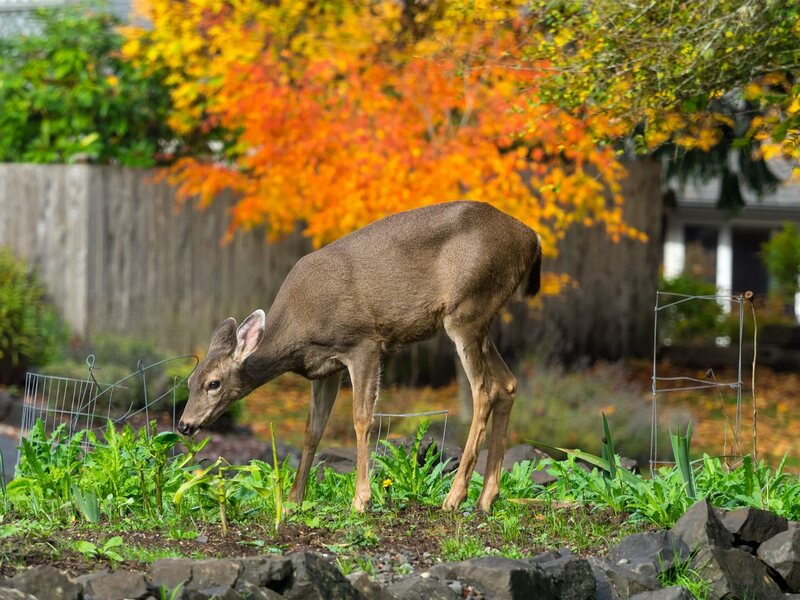 Because deer will return to areas where they found tempting fodder again and again, keep them on the move by applying the deterrent on all stem, flower, leaf and bud growth in your yard and garden. During this peak growing season, spray repellent about every two weeks or when one to two inches of new growth appears. Persuading hungry deer that your yard and garden is not their personal produce bar takes vigilance. With a year-round deterrent spray program, deer will soon learn to take their hungry habits elsewhere. This entry was posted in Real Estate on October 30, 2018 by Mike.